Across the country, many individuals smoke cigarettes on a daily basis. In fact, 15 out of every 100 people in the United States are currently smoking cigarettes. While the rates are dropping, lung diseases and complications from smoking continue to be a primary concern for many physicians. Risk factors such as lung cancer create a serious concern for many people, but with the prevalence of diagnostic imaging services and daily medical advancements, the odds of surviving such serious illnesses are always increasing. North Pittsburgh Imaging Specialists is proud to be your source for affordable, accurate CAT scans in Pennsylvania. We are proud to be Pittsburgh’s CT experts, and our imaging center is ready to help you schedule all of your diagnostic needs. Our CT scans are useful for diagnosing a variety of health issues. Today, we’ll discuss the value of a CAT scan when it comes to diagnostic imaging in relation to the lungs of heavy smokers. If you have been classified as a high-risk smoker, be sure to contact our radiologists today to learn about the importance of our imaging services! Medicare classifies high-risk smokers as individuals who have a long history of smoking cigarettes, utilizing the rule of a 30 “pack year.” This measurement means that individuals who smoke a pack a day for 30 years, two packs over the course of 15 years, or three packs a day over the course of a decade. This amount is determined due to the longevity of smoking and the consistency, with multiple packs causing the risks of dangerous side effects to skyrocket. When you smoke at this heavy rate, your organs will begin to suffer. When you light up, you are introducing over 4,000 chemicals into the body, with each one producing an unhealthy consequence for nearly every organ in the body. From the heart to the liver and surrounding areas, your body comes under a lot of stress from inhaling cigarette smoke. 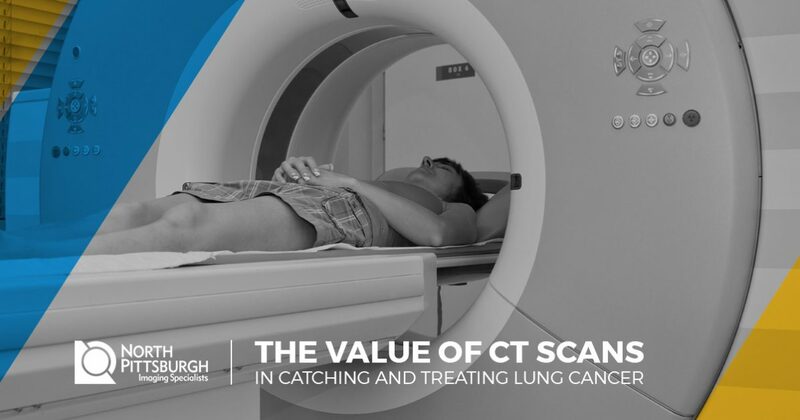 Our CAT scans can be helpful in checking the lungs for any signs of cancer, providing an accurate image that can help doctors to diagnose and therefore quickly treat any cancerous signs. For many individuals, the symptoms and side effects of lung cancer do not manifest until the illness is advanced enough to cause serious concern. The stage of lung cancer you are diagnosed with will play a major role in your chances for survival. While patients with stage IA1 designations (lowest intensity) can expect a 5-7 year survival rate that reaches upward of 92 percent, individuals whose cancer has spread to other parts of the body may receive a survival rate that is less than 1 percent. Computed tomography can be helpful for finding cancer, but the process of undergoing imaging procedures is enough to help heavy smokers cut back. After receiving CT imaging, many patients elect to try and quit smoking. While not always successful, the benefits of quitting are very helpful compared to the option of continuing to smoke. Our quality imaging center is here to help, offering insightful information on smoking in addition to our Pittsburgh CT services. If you are in need of diagnostic imaging services that are reliable, accurate, and affordable, be sure to contact us today for an appointment.